I love that quote because it comes from Steve as we are literally on the cusp of Apple’s amazing run of products in the last 10 years. People were still trying to figure our why it was called an iPod . . . but Steve knew something crazy important that we have to apply in our communications. Design means making things less chaotic and in the process more usable. Our systems will naturally become more complex unless we consistently push them to be simple . . . straightforward and easy to use. Unless we wage war on this chaos people won’t understand what we are asking them to do or take action on. 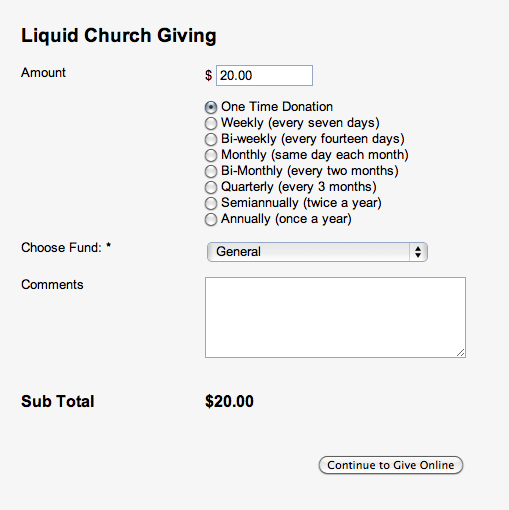 We simplified how people can donate online to Liquid through our most recent update … the increase in online giving equaled three times the total cost of the update in the first 2 months. My jaw dropped when I saw that number. Find the “donate” link buried a few layers deep. Be asked if you have an account with us. If no account . 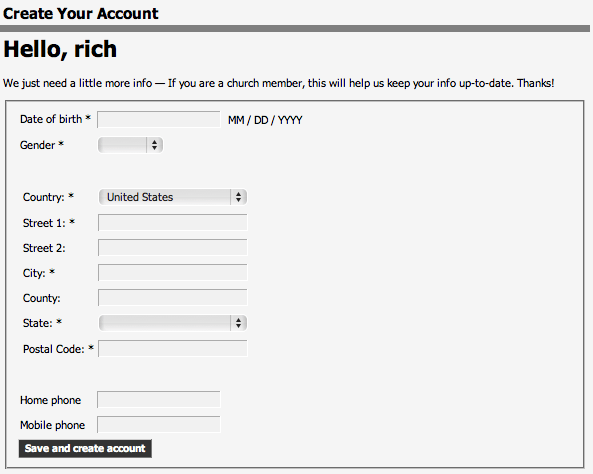 . . set up an account with our church management software. Enter the credit card information and make the donation. Looking back on it . . . it’s astonishing that anyone donated at all. We did this because it made it easier for our admin folks to get the information into our books because people were making the donation directly into our contact management system. We were trying to make it simpler for us . . . which is not all bad. All that information made it simple for us to connect up the donation with the person on the back end. We could be sure that these donations were coming from right John Smith when we compared it against the John Smith’s already in our database. The process is a lot simpler now. Click on the “Give” button on the top right of any page. Enter in how much you’d like to donate. We now have to work harder to reconcile this information with our church management software. But we’ve made the decision that more complex for us is a toll we’re willing to pay for our people. I use the example of online giving because it’s quantifiable. But think about this same principle applied to getting people connecting to small groups . . . or volunteer recruiting . . . or any other area. It’s entirely possible that your design is holding people back . . . simplifying and streamlining could increase your return 10x! Your role as the communications czar (that’s anyone in leadership at a church) is to reduce the chaos . . . to wage war on it because your systems are naturally graviting towards more complexity. I’m a huge believer in simplifying! Simplify everything!! I know you and I worked very hard on this during my designer time at Liquid. In particular, I remember the simple change from blank lines to entry boxes on all of our Forms, which not only improved the general spacing and readability of the page, but also improved the handwriting of users which in turn assists the info entry by Liquid Admin! Pure genius… Awesome stuff bro! I just started a Bible study/Class at a much smaller church in NJ…and there were several ways to sign up. One was to read the announcement in the church bulletin and walk to the back of the church at the end of service to write on the sign up sheet. The other option was, I emailed all my friends and contacts from church, gave them the class description and ended with “CLICK REPLY” to sign up. Needless to say, the easy way–and my initiative to reach out to them via email worked much better. 4 people signed up at the back of the church, 15 sent me emails. In the end, almost 30 people came because people who liked the class forwarded those emails to their friends! Of course that meant I had to mostly generate my own roster with each email, but who cares!